Are you looking for quality, experienced and reliable permanent or temporary nursery staff? If so, you have come to the right place – we can also save you time and money! Smiley’s Childcare Agency is the leading provider to several nurseries, schools and holiday companies in the local area. 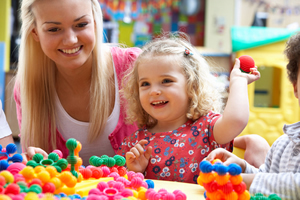 We pride ourselves in providing top quality professional Nursery staff, Teaching assistants and Teachers. We can also offer you extremely competitive rates. We currently supply numerous nurseries across the UK, so understand the importance of sourcing and placing the very best staff. We are also very proud to have excellent working relationships with these nurseries over the last 25 years as well as being able to provide staff that have a passion for working with children and a professional, competent attitude towards their work. That’s why every staff member we send must have first been accepted onto the Smiley’s Childcare Register. Whether you are looking for Nursery Managers, Deputy Managers,Room Leaders, NVQ 2, 3, & 4 Nursery Nurses, or indeed any Teachers or Teaching Assistant staff on a permanent, part-time or temporary basis, please complete the registration form; it only takes 5 minutes and we will then forward you suitable CVs for your perusal in view of arranging interviews. If you would prefer, please fill in our call back request email, and we will be in touch with you straight away. If you are looking for a new position in within a Nursery setting on a permanent or temporary basis, Smiley’s can help you! We have new positions in on a daily basis ranging from Nursery Assistants right up to Area Managers, so if you are looking for a new position, or perhaps looking to further your career by moving up the ladder in to a more senior position, we can advise you with your next steps, help you find the right position and arrange interviews for you, at nurseries local to yourselves. We also have some fantastic opportunities if you would like to further your qualifications and training as we have positions that are happy to provide this. Whether it is a permanent or temporary position you are looking for, we can help you so please feel free to complete the registration form on the right hand side of this page. Or indeed call us for an informal chat and we will advise you the best we can.